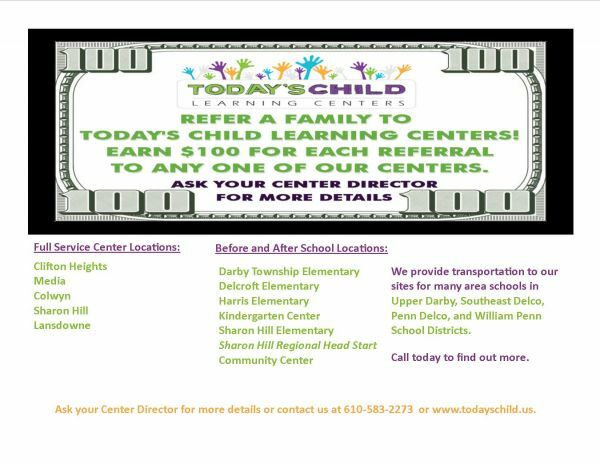 Today's Child offers a generous $100 initial referral bonus to any parent, staff member or member of the community that refers a family to one of our centers. The person who refers the child must fill out and submit the Referal Bonus form within the first week of the child's enrollment. The enrolled child(ren) must remain enrolled for 90 days. The parent must mention who referred them at the time of enrollment. The $100 is per family, not per child and is for new families only. Referral bonuses will pay off any outstanding balances of the referrer before being paid out. The Free Pre-K Counts program and Head Start Feltonville referrals are not included. You must complete and submit the Referral Bonus Form. CLICK HERE to fill out the form. It must be completed within the first week of the child's enrollment or you will not be eligible for the bonus.